Up River Café in Lake Luzerne WOWS diners with great ambiance, views and amazing food! Brimming with character, ultra clean, modern yet retro and teeming with fun, eclectic and beautiful original art -- this is how I would describe the new UpRiver Café in Lake Luzerne. What a delight to be at the UpRiver Café on opening night! The completely renovated café is true to the character of the original popular Papa's Ice Cream Parlor. 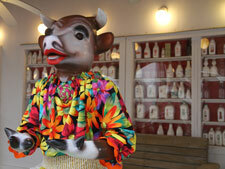 Upon arrival, you are greeted by a large cow statue that is colorfully decorated in a billowing floral top, which belies the owners' artistic sense of humor. UpRiver Café is owned by husband and wife team, Andrew Van Bourgondien and Betsy Brandt. The restaurant reflects the artistic, creative side of co-owner Betsy Brandt, a well-known local artist who exhibits both locally and nationally. The UpRiver Café will feature local artists (current featured artist: Betsy Krebs) with their work available for purchase, which enhances its local appeal. The UpRiver Café is located on main street in Lake Luzerne overlooking the Hudson River. The large windows in the dining room look out over the most calming, spiritual views of the Hudson River. In summertime, the wraparound porch with outdoor seating will be a sure hit, allowing diners not only to enjoy the beautiful views but enjoy the soothing sound of the rushing river. The restaurant is casual. When you walk in, you may think you have set foot into an old fashioned ice cream shop, but you will soon find out that it is much more. The quality of their food is a wonderful, unexpected surprise (I certainly did not expect such fine dining in an "ice cream parlor"). Try it and see if you are not pleasantly surprised! The menu ranges from the high-end Ahi Tuna appetizers to America's favorite hamburgers - from gourmet to classic - with french fries to boot and all prepared to perfection! And it's no wonder, considering that Chef Andrew Van Bourgondien (partner and co-owner of the café) brings an extensive background of working in some of the finest restaurants in the country, from the Sagmore and the Erlowest locally, to fine restaurants in Phoenix, Maui and Matha's Vineyard. Andrew takes cuisine to a new level in Lake Luzerne… I think Rachael Ray will be thrilled with this new restaurant in her hometown! The UpRiver Cafe's views rival some of the best vistas in the Lake George region (certainly in the same league with the Algonquin and The Boathouse), but there is something especially soothing about how the waters invoke both senses as you listen to and watch the fast running waters of the river, while at the same time enjoying a fresh baked brownie sundae on a sunny day. And it gets better... the prices are very reasonable! You'll find that even for the high quality of the food, their prices are still in line with casual dining. View the menu online. There is no doubt in my mind that UpRiver Café will not only be a huge success as a restaurant rivaling Sutton's as a destination for quality casual dining and Martha's in Lake George as a hot spot for an ice cream year-round. Best of luck to this great new café in Lake Luzerne, NY. I give the UpRiver Café 5 Stars!